The Chrysler Group claims, “they don’t get much bigger” than its new Ram Long-Hauler Concept truck and at a whopping 24 feet (about 7.3 meters) long, who can blame them? 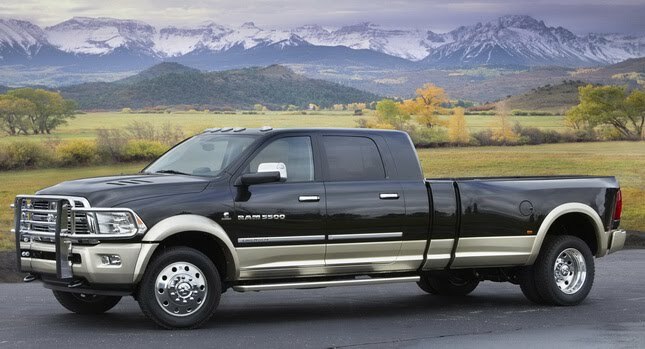 Based on a Class 5 Ram 5500 Chassis Cab, the monstrous Long Hauler rides on an extended wheelbase measuring 197.4-in. (5,014mm) in length, which is more than enough to fit a Mercedes-Benz E-Class (191.7-in)! The concept truck is also 79.1 inches tall and tips the scales at an environmentally…unfriendly 9,300 lbs (4,218 kg), or close to 2.5-times as much as a Mercedes-Benz E350 sedan. Ram says the Long-Hauler has a maximum Gross Combined Weight Rating of 37,500 lbs (16,783 kg).